Look at the legs on this one! 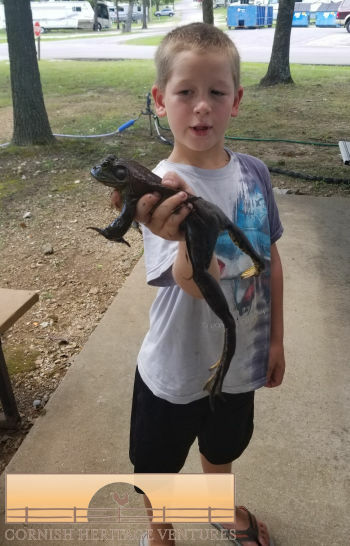 Caleb was ecstatic when he caught this bullfrog last week! As you know, Caleb LOVES frogs and toads of any size but this year he has been especially fascinated with the bullfrogs that reside here at Treasure Lake. Believe it or not, he caught this one with his fishing rod. (The largest one to date.) He used a piece of hotdog and “teased” it close to the pond’s edge. This bullfrog was obviously hungry as they do not usually go for hotdogs. Daniel and him were very diligent in removing the hook and after Caleb had brought it to show us, he let it go back into the wild.